In the Fall of 2012, the Hop and Mae Adams Foundation (“Mae”) purchased the vacant [Old] Stewart Title Building (111 W. Proctor St.) with the intent of energizing downtown Carson City and encouraging technological growth and economic recovery. “Mae” will work in partnership with Carson City Careers and Northern Nevada Development Authority to identify and promote new business and business expansion opportunities in Carson City’s downtown area. Carson City Careers is a not-for-profit venture capital firm created and funded by Hop & Mae Adams Foundation. It finances business needs in Carson City, including patents, licenses, and other startup or expansion costs. The purpose of the purchase of 111 West Proctor Street is to provide a business incubation location for start-up and expanding businesses. This incubator is structured to provide low-cost incubation rents for a stated period of time for these fledgling organizations. Said rents will vary based on the individual company’s startup gross sales. As they grow, the firms will relocate to traditional leasing spaces throughout Carson City. It is intended that these efforts will attract innovative and technology-based industries and younger urban workers, ultimately bringing new life to the area and diversifying Carson City’s economy. The negative impact of the highway bypass to Carson City’s downtown core has wreaked havoc on property values, and many structures remain vacant. In conjunction with the current economic climate, these events have caused many downtown businesses to struggle, move or go out of business. The purchase of the Old Stewart Title Building is the first stepping stone in not only filling vacant properties but also in kicking off entrepreneurial and economic diversification efforts. 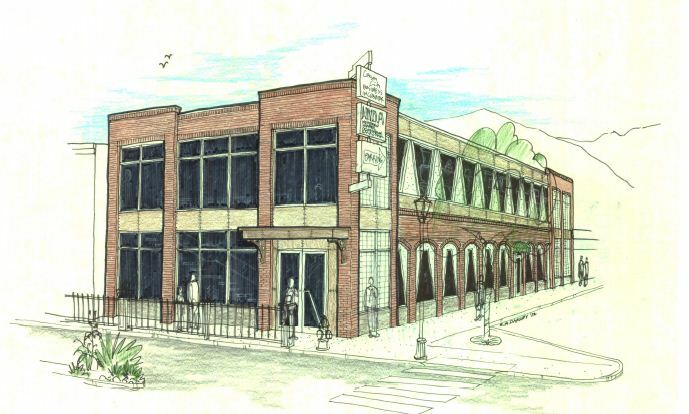 Renovations to 111 W. Proctor will work in concert with the approved downtown master plan, with modifications scheduled to occur in early 2013. Built in 1962, the 8,390 square foot, two-story building is in need of many high tech upgrades. According to Robert Darney, one of our local architects who is involved in the project, remodeling will include systems upgrades to current heating/air conditioning, electrical and plumbing systems and wireless technology. The structure will be brought up to current code with ADA requirements met as well as adding much needed insulation. The exterior will be modified to include glass, brick and metal features that complement the proposed downtown master plan vision. The project is currently undergoing Renovations with tenant space available early 2014.